Selkirk Glass mystery ... Help me please before i tear my hair out !!! Topic: Selkirk Glass mystery ... Help me please before i tear my hair out !!! Re: Selkirk Glass mystery ... Help me please before i tear my hair out !!! ... However, I am about to go away: are you in a hurry or can these pictures wait until the last week of August? Thank you for your offer, Sophie: no hurry whatsoever - as mentioned, I am just in the preparation stage for the Selkirk project - will take a while until anthing goes online. Well - my view will likely be somewhat biased: I regularly check ebay for images which might be of interest for ScotlandsGlass - from what's offered there I can assure you that the vast majority of Selkirk weights on offer is not signed (with a name) - but then there surely will be a preponderance of unlimited weights on ebay. On the other hand - whilst my Selkirk collection is much less impressive than yours - amongst my limited editions is at least one (1984 Bluebells) which is not signed: as I bought it directly from Selkirk, and it came with certificate (98/250) I very much hope it's genuine :usd:. You wouldn't by any chance have a list of your weights (you'll find my mail button in the lefthand column)? Thanks, Ian - our postings seem to have crossed - and you already answered my plea: thank you very much! As said above: best (for me) would be a list of your weights - so I can compare with my list. Even if I finally get all my missing catalogues from Yelverton (good to hear that they actually should have all of them - They were going to contact me again in due course), it is always nice to have additional views, not just the (scanned) catalogue images. I have checked the 1985...1990 catalogues - whilst there are several swirl&bubble weights, none of them seems to have the right combination of swirls and bubbles with the right colouring. Whilst with single views in the catalogues I may have just missed it, the chance is it is falling into the category described This is a Selkirk Glass table weight, it has no name, produced initially as an idea for a weight but not considered good enough in design to be named ... above by Robert. 1980 Primroses, 1979 Seabed, 1980 Little Owl (not sure if there is one in the back row), 1978 Dragonfly. All of those, and a different Dragonfly, named Dragonfly, from 1980 (only one Ive ever seen). Also Penguin (only one Ive ever seen) and many others. Just uploading some new pictures showing more detail, so have a look through and let me know which ones you'd like and then I can check the names. I've also got many more in the loft at the moment, but figure this will be a good starting point!!!! Going slightly of on a tangent you can have the pictures of the 4 seasons set and the Purple (maybe blue?) coral caithness weights which finish later on this evening if you guys don't have them! Hopefully you can get to all the pictures from this one link. Joking apart, it is nice to hear that some Selkirk weights really exist - like the penguin. It is alluded to in a number of places, but I have never seen one. Can you tell me the size of the edition? Many many thanks for sharing these treasures with us. Peter has one with facets, as when making them there was one with some damage of some kind, so he cut facets into it to take the damage away. 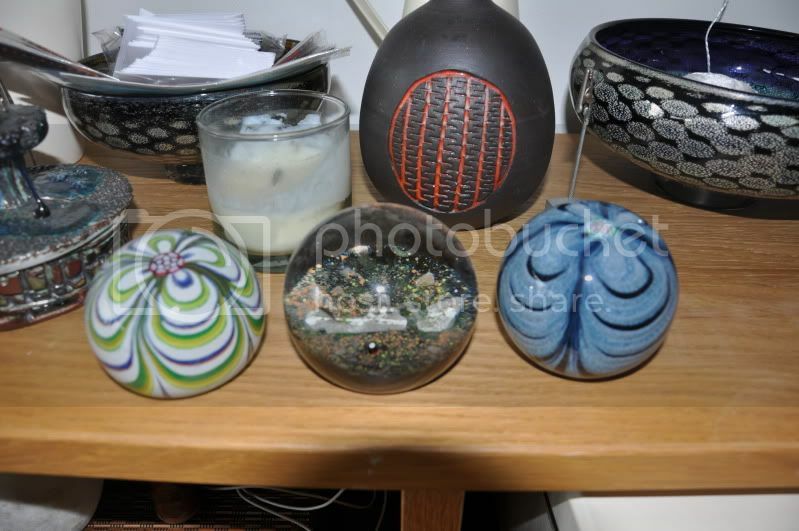 It's in his display cabinets at scottish borders art glass in Hawick if you're ever around there, well worth a visit! Will check Penguin later, but the one I have is the only one I've ever seen, as is the fruit basket! I share your interest in Peter Holmes. I think that his work is fantastic. I am planning a trip to Hawick very soon. I will look out for the facetted shipwreck in the display cabinets.